It is illogical to suggest that such rapid increases in homelessness are attributable primarily to economic hardship. The economy is much better now than it has been for the past decade. At this same time, however, we have seen a huge influx of methamphetamines and opiates from Mexico. A recent Fact Check in Voice of San Diego says I was wrong when I stated that most homelessness is linked to drug and alcohol abuse. However, I stand by the words I used to describe the nexus of homelessness to drug and alcohol abuse. I have spent my adult life working with people who are mentally ill, and by extension, people who are homeless. The prevalence of substance abuse among the homeless population is beyond dispute. I have been working in mental health since 1988, and I have assessed approximately 70,000 patients in my lifetime, many of them homeless. I have a bachelor’s degree in psychology and nursing, and a master’s and doctorate in clinical psychology. I also work in a busy emergency room doing psychiatric evaluations. I work in the world of first responders, which has a different vantage point than the universities and think tanks quoted in Voice of San Diego’s Fact Check. Police officers, firefighters, emergency room clinicians and paramedics will confirm the truth of the pervasive influence of substance abuse in the homeless community. So why then do the national homeless advocacy groups quoted in Voice of San Diego’s Fact Check dispute this concept, and propose numbers that paint a much more moderate take on substance abuse in the homeless community? The main reason is because the information they use is gathered by asking homeless people if they abuse drugs or alcohol. I know it’s shocking, but people lie about this. The nature of addiction is to downplay its very existence. Harold Brown, who runs the East County Transitional Living Center, says that most people who lie about their substance abuse problems do so because they fear that they will be denied benefits and services if they admit to using. By the way, he thinks the percentage of people using drugs or alcohol is more likely in the 80 to 90 percent range. Another reason is that homelessness is very politicized. Like everything – from elections to football – Americans have assembled themselves in camps of left versus right. The issue of homelessness is no different. I fear that my statement on substance abuse in the homeless community is being judged by those political parameters. I was mystified when my statements were the subject of debunking as opposed to sparking interest and debate. 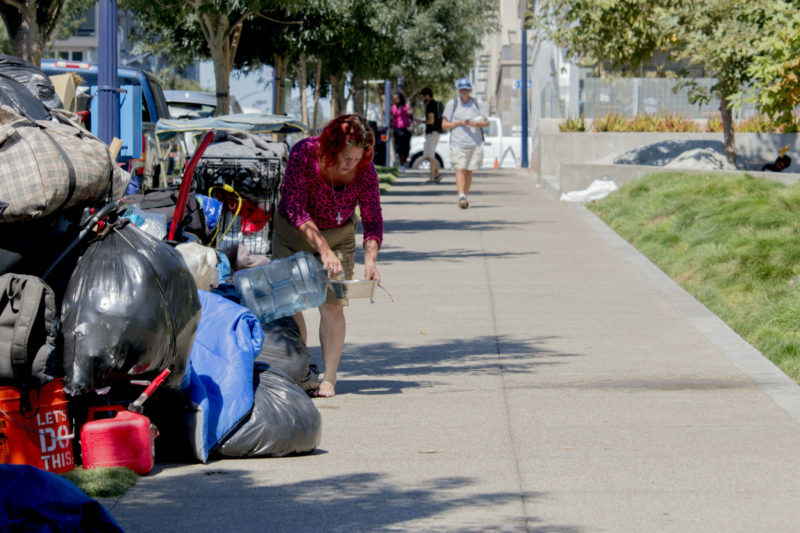 Even experts on the homeless issue have difficulty coming to a consensus. An article in East County Magazine cites the statistics of the homeless who abuse drugs at a minuscule 1 percent. A study conducted by the Substance Abuse and Mental Health Services Association cites the numbers as 38 percent abusing alcohol, and 26 percent abusing drugs. A recent study in Boston showed that overdoses have surpassed HIV as the leading cause of death among homeless adults, and found that opioids are responsible for more than 80 percent of these deaths. The study found that homeless adults, ages 25 to 44, were nine times more likely to die from an overdose than their counterparts who were stably housed. A survey by the United States Conference of Mayors found that 68 percent of cities reported that substance abuse was the largest cause of homelessness for single adults. So if I am wrong and the number is closer to 70 percent than 90 percent, how is that really relevant? Is it not reasonable to point out that substance abuse is a massive problem, in regard to homelessness? It defies reason to try and downplay the reality of addiction in the homeless community; how can this approach be of any help? How can we effectively fight the problem if we remain willfully ignorant of the causal factors? In the past two years, we have seen a 35 percent increase in the homeless population in my city of El Cajon. Beach communities have seen over 100 percent increases. It is illogical to suggest that such rapid increases in homelessness are attributable primarily to economic hardship. The economy is much better now than it has been for the past decade. At this same time, however, we have seen a huge influx of methamphetamines and opiates from Mexico. It is important to make these distinctions, because fighting the homeless battle on the front of economic injustice might be a massive waste of time since the real cause is substance abuse. Do we really have time to waste several years chasing after a false solution to a false problem? Bill Wells is the mayor of El Cajon.